The Importance Of Home Automation | Calgary Alarm Inc.
Over the past several years, the technological advancements that have been made in home automation, particularly when it comes to our ability to wirelessly interact with technology, have been tremendous. 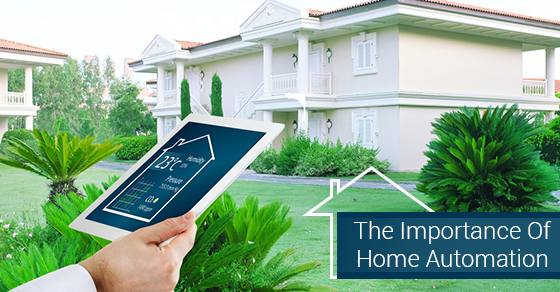 There are now countless sophisticated ways homeowners are able to both monitor and control the internal processes in their homes to make sure that everything is working safely and optimally. If you are considering automating your home, or adding to your existing automation, below are five reasons why home automation is important. Added safety of appliance and lighting control. Home automation allows you to control both the lighting and the status of your appliances—such as the oven and fireplace—remotely, using your smartphone. This means you can turn the lights on and off as needed, as well as ensure that any potential safety concerns are addressed, no matter where you are. Added security of automated door locks. Being able to remotely lock and unlock your doors means peace of mind and convenience. This way you are able to more effectively and confidently control who enters your house and when, letting in people who need to get in, and making sure doors are locked to the outside world after you’ve left. Increased awareness through security cameras. Automated home security cameras mean that you are able to visually check, whenever you like, that both the inside and outside of the premises are secure. It also lets you check to make sure that pets and children are not in areas or doing things that are off limits. It is often the case that we leave early in the morning, in a rush, and forget to adjust the thermostat for the temperature change that will have occurred by the time we get home. With home automation, you can conveniently adjust the temperature inside your house, even on a room-by-room basis, from work, the gym, soccer practice, or wherever you happen to be. The pace at which we live our lives in the 21st century is often break-neck. We measure our days in minutes and seconds and often don’t have many of them to spare. Home automation lets to be confident that even if you forget to manually do something before leaving, you can quickly rectify the problem while on-the-go with the use of a smartphone and the touch of a button. Home automation is a great way to uncomplicate your life. From security, to preventative measures, to the added convenience of being able to fix an issue remotely, home automation is an important part of home ownership in the 21st century.